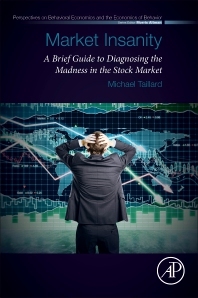 Market Insanity: A Brief Guide to Diagnosing the Madness in the Stock Market is an engaging and accessible primer which applies modern behavioral finance to equity markets. It helps readers understand how logical investment decisions can be betrayed by what Taillard calls "the insanity," all those behavioral quirks which cause us to achieve less than optimal utility. The book describes how limited information, habit, the rules of the game, asymmetric information and ego blend together in potentially toxic ways in market environments, thus creating bubbles, stock runs, and more prosaically, even ‘normal’ equity prices. In addition, the book discusses the implications of these behaviors in-depth. In so doing, it helps the reader to not only predict the madness within equity markets, but also helps them develop solutions that address and mitigate outcomes. This book is the most fun I've had with economics or neurology, ever! Michael Taillard is a private economic consultant, emphasizing applied strategy and quantitative, behavioral research. He has worked with private companies from all around the world, federal and local government and political organizations, international nonprofits, and a variety of media outlets. He has taught at universities since 2002, and currently hold adjunct status in the graduate schools at Central Michigan University, as well as Bellevue University.